At least two soldiers guarding a Jewish community center have been wounded by a knife-wielding attacker in Nice, in southern France, police say. The country has suffered a spate of hate crimes in recent months. The attacker pulled out a 20 cm blade and struck one of the guards on the chin. As two others tried to interfere, he swiped at them, hitting one on the forearm, and another on the cheek. None of the injuries are thought to be life-threatening. The suspected attacked then attempted to flee by foot, but was quickly stopped and detained. Mayor Christian Estrosi told local television that an ID card with the name Moussa Coulibaly, a common West African surname, had been found on him, and said that a search has been started for potential accomplices. An unnamed official said that Coulibaly was aged about 30, and had a past record of theft and violent crime. "It seems like a premeditated and quite violent act," said regional police chief Marcel Autier. Mayor Estrosi immediately took to Twitter to condemn the attacks, and demand a “heavy punishment” against the perpetrator. 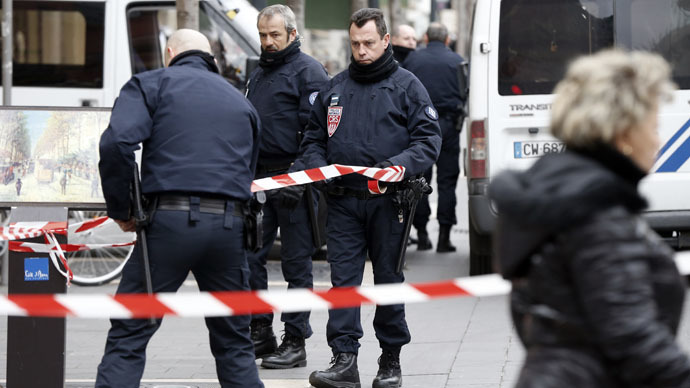 Some 10,000 extra troops and police have been assigned to potential extremist targets, following the Islamist attack on the satirical magazine Charlie Hebdo last month. More than 20 people, including the perpetrators, perished in the initial assault, and subsequent crimes, as the attackers attempted to get away. In what may be a coincidence, one of the gunmen, who killed four people in a kosher store in Paris, before being shot by the police, also bore the same surname as the suspected Nice attacker. Amedy Coulibaly pledged his loyalty to the Islamic State in a video recorded prior to his death. The Nice attack came on the same day as French authorities arrested 8 suspected Islamic State recruiters in Paris and Lyon. Interior minister Barnard Cazeneuve said on Tuesday that 161 anti-terrorist investigations are in progress, with 547 people identified as parts of terror networks, though many recent attacks in the West have come from so-called "lone wolves" - radicalized individuals, who plan and carry out the attacks without help from a terrorist cell.